Within a few weeks of Obama's coronation it has become clear this new emperor will be as aggressive and violent as his immediate predecessors Bush II, Clinton, Bush I and Reagan. We are expected to believe there will be a "new tone" in US foreign policy. However, a new tone is just that, a new tone. It means the essence will not change at all, nor will the forms. Just the tone. That must have been the change Obama has been promising his supporters and all those poor devils who believed in him and who voted for him. The remarks made by Obama's messenger boys at the 45th Munich Security Conference have made this abundantly clear. Biden issued some ominous threats: first that the US will be guided by the principle that "there is no conflict between our security and our ideals." This observation is an allusion to the paranoid security measures introduced by the Bush II regime. However, since the entire legal framework enacted by Clinton and Bush II and establishing what is virtually a Gestapo-state, has been left intact, this amounts to a very serious threat indeed. The US is apparently resolved to enslave its own citizens in order to achieve its foreign policy objectives. The second threat is directed at the outside world, to the effect that the US will use force: "the force of arms won our independence, and throughout our history the force of arms has protected our freedom," Biden said. This is both a threat and a distorted rendering of historical reality. It was the force of French arms that won US independence. Since then the US has been using its own force to wage war mainly against weak tribal and Third World enemies in order to secure access to assorted mineral and natural resources often far beyond its borders. US "freedom" was never really challenged by anyone. It still is not today. All designated US enemies have either been (and still are) bogus or grossly exaggerated. And, as with every serious mess the US has gotten itself into since trying to gain its independence, it desperately needs foreign help. Yet quite astonishingly, with the disaster now befalling the US economy (or what is left of it), the US demands foreign aid. It does not, as would befit its real position, humbly ask for it, no, it demands it, invoking some supposed common ideals. As the old warhorse put it: "that's the basis upon which we want to build a new approach to the challenges of this century. America will do more, but America will-that's the good news. The bad news is America will ask for more from our partners, as well." This surely sounds compelling. By itself the US cannot solve the problems it has created, such as the Afghan and Iraqi tragedies. Biden stated that quite correctly. As a matter of fact, the US has never been able to solve its major international problems by itself, nor to fight its wars without calling in the help of others. Biden put it thus: "As we undertake (a review of our policy in Afghanistan and Pakistan) we seek ideas and input from you and all of our partners. And we genuinely seek those ideas. We are sincere in seeking your counsel." If that does not sound like a desperate call for help, I must be badly mistaken. Indeed. The US must be at its wits' end trying to salvage what it still can from its pathetic bungling in Afghanistan and Iraq. It hopes more troops will solve the problem, like it mistakenly believes more dollars thrown at bankrupt financial institutions will solve its economic mess at home. The US is now increasing the pressure on its NATO clients to chip in and send more of their precious soldiers into the Afghan death trap. And more trouble is on the way, with Obama seeking yet new problems to get enmeshed in. For instance, by continuing his predecessors' efforts to try and bully Iran into accepting outrageous US demands to stop its nuclear program. 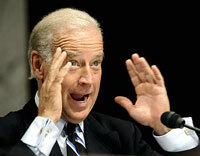 The program is definitely not an illicit one, as Biden claims. There is, therefore, no change whatsoever in the US stance vis-à-vis Iran. Nor have the US abandoned their demand that Iran shelve its nuclear energy project as a condition before sitting down for talks. Obomba and his underlings may say so but the reality is different. They are practicing a venerable US trick: to deny reality by giving it another name in order to confuse the opponent, client, customer, friend or whoever. This technique is called "newspeak", coined and described by George Orwell's in his masterful novel 1984. Nor has the aggressive and provocative stance of the US against Russia been modified one iota. The tone, yes of course, the tone has changed somewhat. But only an idiot would be taken in by such a cosmetic change. The US still wants to install an antimissile system in its Polish and Czech client states and it is still talking tough on Abkhazia and South Ossetia. The clenched fist of the US did not open here to shake hands with anybody. In sum, Obama's message read by Biden is insincere in its form (or tone if you will), and unrepentant and aggressive in its content. This is not the message of a man of peace, but a warmonger's attempt to buy time and to deceive the world. The main purpose of Biden's Munich speech, apart from holding out imaginary olive branches to Iran and Russia, was to solicit more money and troops for Afghanistan from NATO clients. The remarks made by Obama's other servants at the Munich Conference has borne this out unequivocally. General Petraeus, the military chief of US forces in the Middle East and Central Asia echoed Biden's clamor for more troops from the NATO clients. And the general wanted more, according to bloomberg.com, "he ticked off a list of needs for Afghanistan including more special operations forces, transport and attack helicopters, fixed-wing warplanes, medical evacuation units, military police, engineering units and trainers for the Afghan army and police." And mind you, all this at a time the world is in the grips of the most serious economic depression in a century. US envoy for Afghanistan and Pakistan Richard Holbrooke also joined the chorus urging the Munich audience to PLEASE send more men and weapons to fight what he termed "an existential campaign" in Afghanistan. Whereas in a way the US requests for more NATO troops from Europe is understandable-after all, the US is quite a poor military performer-such calls from Europeans are frankly pathetic. Not surprisingly, these came from Jaap de Hoop Scheffer, NATO Secretary General in name but in fact a spineless blob and a war criminal who should be in the dock at the Hague International Criminal Court. And of course the British joined their US master in calling for fresh cannon fodder (rather, IED fodder). British Defence Secretary John Hutton once again proved his country had better join the US as the 51st state at the shortest possible notice. It cannot possibly be regarded any longer as sovereign. The question is now, what will the NATO clients do? Will they obey the new Emperor in Washington or will they finally realize the man has no clothes. Perhaps the recent change of color will help them see reality. The economic depression may also induce caution. Most European governments are so terrified of the political fallout from the current economic disaster that they have called a meeting to discuss emergency measures. The political future looks grim indeed. The Iceland government has already been forced out to make room for a more representative one, more faithfully reflecting the popular will. No doubt other governments will be brought down by angry crowds. The spirit of revolution is in the air, the winter will end soon and spring is on its way. This does not bode well at all for political stability. European governments will be forced to make a choice: either they must serve the interests of the empire and their masters in Washington, or they must serve those of the people who voted for them. For almost sixty years, they have been doing the former. Now they might be forced, for once, to do the latter!